Step 1. Enter Register Information: Go to PaceMaker registration page, select the payment currency and enter your optional information, and click "BUY NOW" button to initiate payment. Step 2. 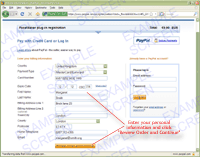 Select payment option: to pay with your Credit Card or Bank Account, click the link "Use your credit card or bank account - Continue". 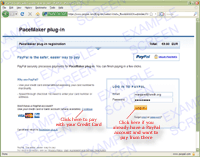 If you already have a PayPal account and wanted to pay with money there instead, click the "Log In" button. 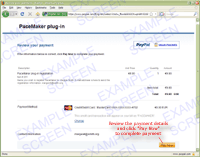 Notice that you don't need to create new PayPal account to register PaceMaker unless you already have one. Step 3. Fill in your Credit Card / Bank account information. After entering your information, click "Review Order and Continue" to accept your information and proceed to reviewing the payment details. 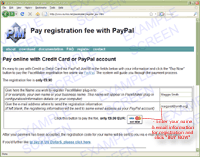 Step 4. Review the payment details: Review the registration payment details and accept by pushing the "Pay Now" button. Step 5. 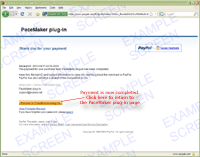 Payment completed: Payment is now completed, click the "Return to PaceMaker plug-in" to return to PaceMaker page. Step 6. Receive your registration codes: After receiving and validating your payment, the registration codes will be sent to you by email immediately. 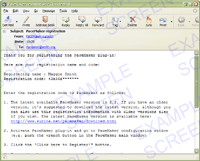 After receiving the codes by email, please see here for instructions how to activate the registration codes in PaceMaker plug-in. Notice: If you have not received the codes within 30 minutes after your payment, please notice that email programs and service providers have automatic Junk mail filters that can accidentally capture the registration email. In case of not having received the codes, please thus check your email Junk / Spam folder in case the registration email were there. If you already have emptied the junk folder, please send email to <support@surina.net> and ask for resending your codes.